Courtesy National Civil War Museum, Harrisburg, PA.
1. Vermont's Civil War related civilian and military deaths peaked in 1864. About how many died per week that year? 2. What is a sutler or victualer? 3. The November 24, 1863 St. Albans Daily Messenger reported on the address that President Lincoln recently delivered at the consecration of the National Cemetery at Gettysburg. 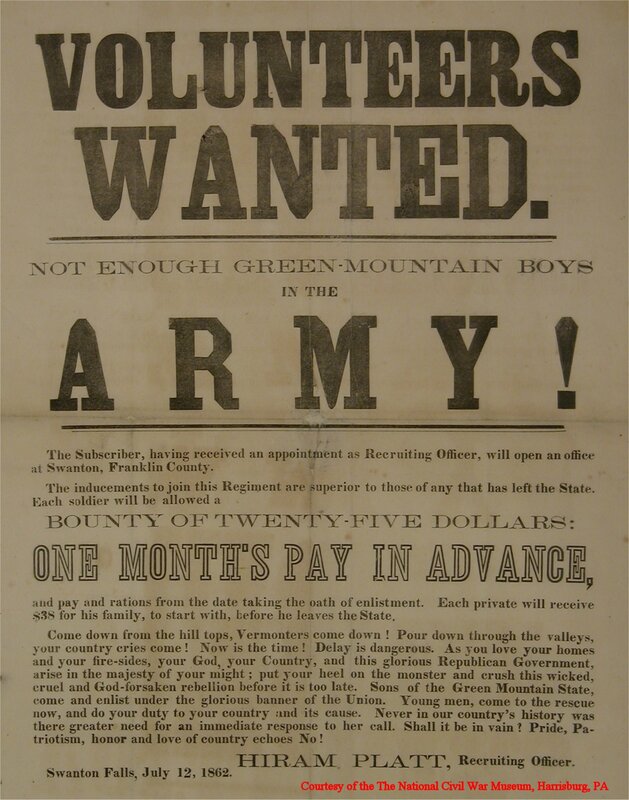 The same paper reported Montgomery had filled its most recent quota for men for the Army. How many? You know how you can get so close to something, or some topic, that you take for granted others just know what you're talking about, or can see the same thing? Well I have to plead guilty and was reminded during the Annual Meeting not everyone knows about some upcoming work. I was talking about the fund raising we needed to do for repairs and restoration of the west wall and after the presentation several members asked me and other Board members what needed to be done? The wall looked fine and even the visible part of the outside foundation seemed solid and crack-less. So here it is in a nutshell. A good chunk of the western wall is in the same condition as the tower. The sill which is on top of the foundation is rotted and so are the bases of some posts, especially near the middle window. This causes the wall to sag and the weight to rest on the window frame. Bad things will happen, it's just a matter of time. We also know there has been some water infiltration at a gap in the fascia. The ceiling near the middle window is stained and the faux beam on the ceiling is sagging too. Consultations with our timber frame expert indicate the window can PROBABLY be stabilized and protected with temporary bracing to allow them to do the needed work with it in place, but there's always the possibility it would have to be removed in order to do the work. The caveat "we won't know for sure until we get in there" applies to every 177 year old building. None of this is for the faint or heart. While the work is daunting so is the cost. Estimates from two years ago put it at about $107,000. Our experience with the tower, and from talking with others is to be prepared for it to cost considerably more. The tower project was double the original estimate, in part because of additional work required once we opened the wall and could eyeball the wall's innards (technical term!). We will work hard to secure more grants, but we will have to be ready to match the grants dollar for dollar. I would like to have $100,000 available through our savings, line of credit, and private grants/gifts before we write our next grant applications. We have about $40,000 ($20,000 cash and $20,000 line of credit) of that now, thanks to your generosity, and support through the TD Bank Affinity Program. With your help we will get there. We received word in late May that we did not win the Preservation Trust of Vermont (PTV) award for our 2011 work on the front entryway and tower. Director Paul Bruhn said competition was particularly tough this year, applauded us for our good work, and encouraged us to keep on trying. We guess we can't win them all. Susie Arioli kicked off our 24th season of CBTC to a packed house on June 23rd. It was 12 years since her last concert and she promised to come back in 2024! The Gordon Stone Band will be here on July 14th and the Fanning / Davydov Duo will play in the heart of foliage season, October 6th. All at Pratt Hall at 8:00 p.m. Thanks to the Eastman Charitable Foundation and all our sponsors who underwrote the series once again, and to Steve Hays for his yeoman's effort pulling everything together. 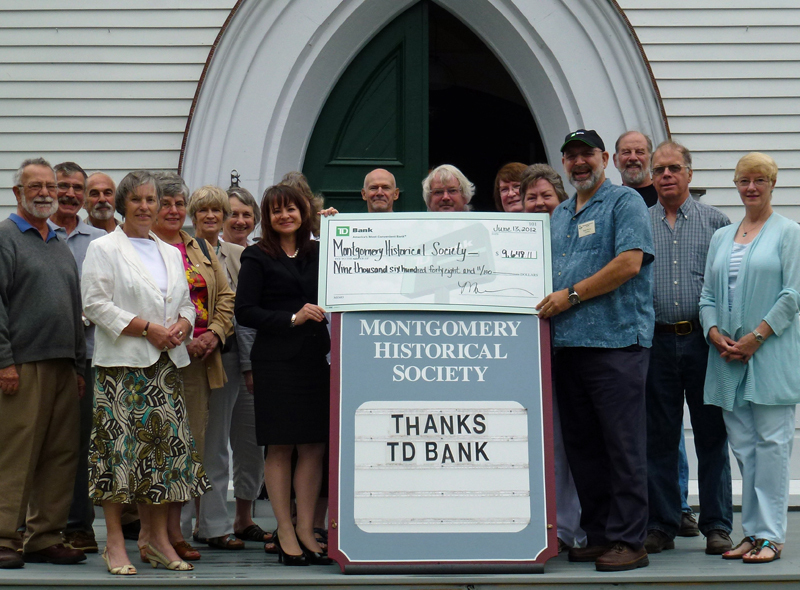 On June 13 TD Bank's Mara Pressman presented the Society with it's third Affinity Program check in three years. This year's donation from the bank was nearly $9,700, bringing the three year total to nearly $25,000. Thanks to TD Bank and thanks to all of our members who have designated the Society as their Affinity beneficiary. Mara Pressman presents a BIG check. This year's events will be the last weekend in August simultaneously with the annual Covered Bridges Garden Club's (CBGC) Harvestfest. There will be the membership/artist reception Friday evening, the 24th, followed by the Show and Sale on Saturday, the 25th. In the past we've provided room on our lawn for the Club's "Trinkets and Treasures" sale but they will no longer be doing it. Parma Jewett is organizing a similar event this year to benefit the MHS. If you have items you would like to donate please email us or give Parma a call. Drop off days will be Saturdays August 11th and 18th in the morning, or by appointment. No clothes or electronics please. Pratt Hall hosted another Community of Expressive Artists meeting in May and will again on July 20th. These programs provide support to local writers, painters, musicians, and others. Pratt Hall is a wonderful performance space and our Board is happy to support these programs. Our bylaws require us to have an Annual Meeting every June to provide a "State of the Society" report and elect Board members and officers. This year's was June 29th. 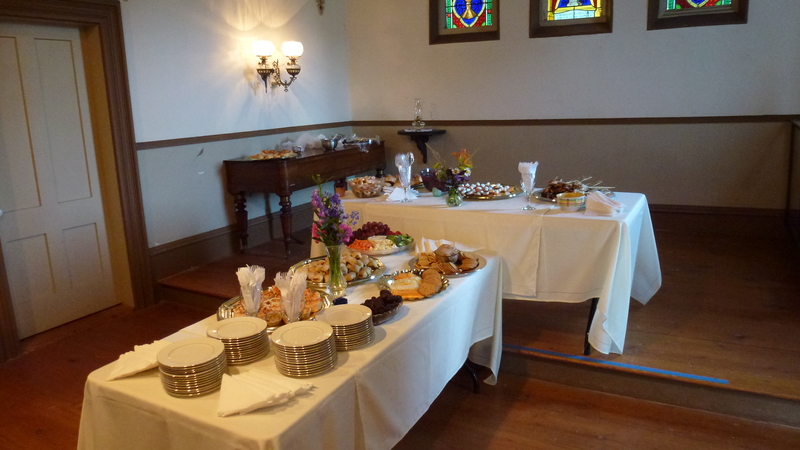 The 50 members present were treated to Parma's fine fare, and our exhibits on Zack, and "Montgomery and the Civil War". We continue to meet our mission statement and are financially sound. We are aggressively saving for the large project on Pratt Hall's western wall and hope to be ready to start writing grant proposals next year. Our membership numbers are on track for another great year but a little behind compared to this time last year. Our 2011 actual revenues and expenses broke records with both just over $40,000. Minutes of the meeting or copies of the presentation are available upon request. Thank you all. Parma's Annual Meeting Spread, Yum! Our Board meets the third Wednesday of every month. The meeting is open to all members and the public. Since the last newsletter we've hosted two programs that were well attended, educational and fun. Our own Dave Bennett spoke about his new book on Ethan Allen's failed attempt to capture Montreal. 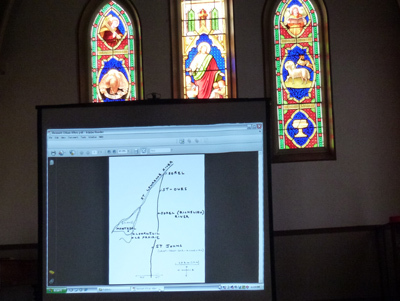 Dr William Tortolano presented a slide show on the "Canadian Group of Seven". Dr T is also an accomplished organist who's played in some of the world's famous cathedrals, and he also treated us to some riffs on our Estey Organ. We discussed the possibility of him doing a concert with his son, a professional cellist. You won't want to miss it if we can pull it off. Stay tuned. This year's scholarship winners are Grady Kennison and Charlotte Hartman. Grady will be attending UVM in the fall where he hopes to major in English and minor in either Information Technology or Film . Charlotte enlisted in the Vt Army National Guard and will be pursuing Criminal Justice studies at Champlain College. Congratulations and good luck! Thanks also to our selection committee, Rita Kalsmith, Patty Perl, and Patty Hathaway and to Marjike Dollois for getting out the applications to all Montgomery Seniors every year. Click here for the latest info on this year's MHS Events and a handy list suitable for printing. 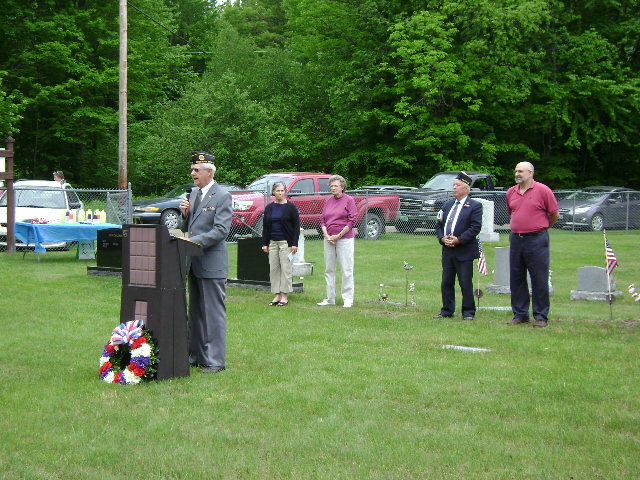 The Society's annual program was well attended and had great weather. Our guest speaker was Merle Van Giesen, a 19 year veteran of the Navy. Our 2012 membership drive is well underway (see report under Annual Meeting below) We will be sending reminder notes out soon. Please join or rejoin us... every member matters! The Board awarded the tower and front facade painting to member Ted Bruckner. Ted began work July 2nd and is making great progress. We will also be making repairs to portions of the clock faces and other bits as needed. We hope to start work on the new wheel chair ramp in July as well. 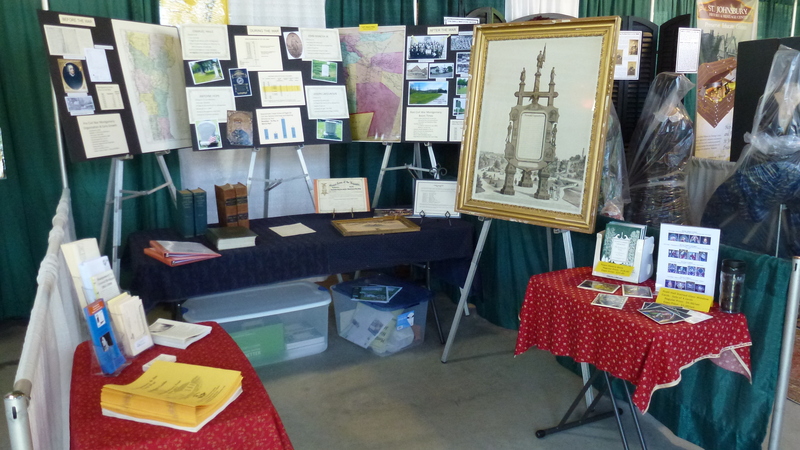 Our Vt History Expo exhibit was well received. 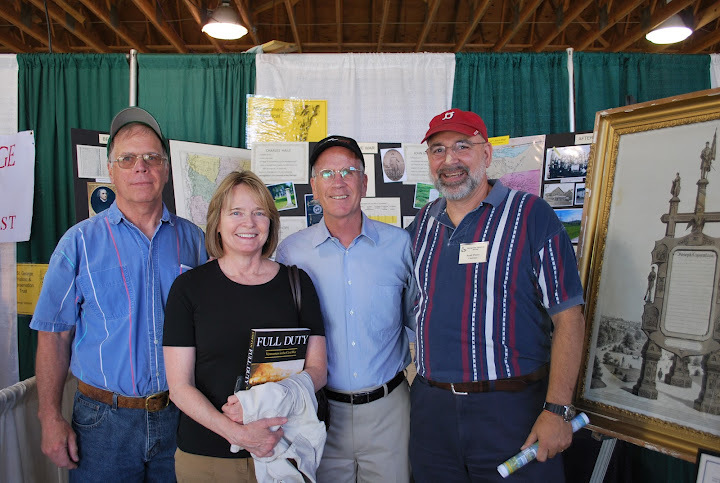 As with other Expos past, we learn just as much from the people who stop by our booth for a chat as we do in presenting the exhibit. One gent who specializes in VT postal history told us he had the only known cancellation from the Hectorville Post Office, and that it Hectorville was called Glendale for a short time. There were lots of fascinating booths from other towns and a few politicians taking it all in too. Our exhibit guide is posted on our web site and the exhibit will be displayed at other venues over the next year. Last newsletter we reported on the good natured controversy surrounding July on our 2012 Then and Now calendar. Some folks took issue with our call on the Millinery Headquarters, thinking it was the Village Store, or another building, and not Trout River Traders (TRT). 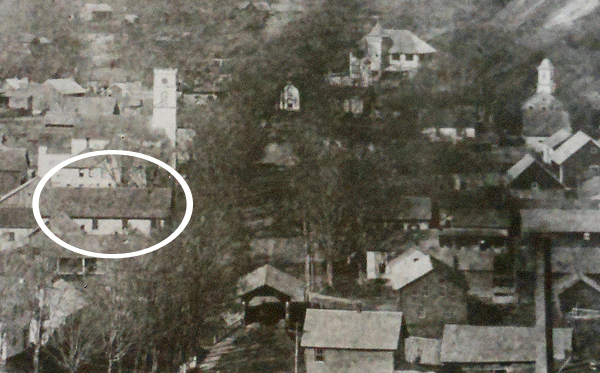 In fact, it was located just two buildings west of Pratt Hall on the other side of George and Mary Robert's home. Kudos to member Bob Gilmore who agreed with your editor it wasn't the Village Store and for laying out the architectural improbability that it was TRT. Also to Cedric Lanphear who figured out it was the building shown above. His detective work was confirmed by George Roberts who has pictures of the fire which destroyed the building. July - 1802 Petition filed to establish Montgomery's first government. August - 1897 Montgomery's Percival Shangraw born. Would become Chief Justice of VT Supreme Court. September - 1908 Hectorville Union Chapel dedicated. 2. A sutler or victualer is a civilian merchant who sells provisions to an army in the field, in camp or in quarters. The sutler sold wares from the back of a wagon or a temporary tent, allowing them to travel along with an army or to remote military outposts. Sutlers' wagons were associated with the military while chuck wagons served a similar purpose for civilian wagon trains and outposts Source: Wikipedia. 3. b. 8. but 19 would go from, or credited to Montgomery in 1863. JoAnne Bennett is working on her 4th (and final?) draft of the 3rd edition and we've been in contact with our printers to see how to go about the million of details to get us ready for printing. In addition to the manuscript, we still need to do some fact checking, sourcing, pictures and graphics, formatting and layout etc. We are making progress and it's a good read. We are happy to make it official. Patty Perl joined our Board in April and was confirmed at the Annual Meeting. Welcome aboard Patty! We now have just one vacancy on our 14 member Board. We now have two YouTube videos posted with links to them via our web site. One is last year's video of the tower project (under the Pratt Hall link), and the other is our "Carry the Weight" exhibit (under the History link). We're working on a version of our Civil War exhibit too.